The Farm | Carnahan & Sons, Inc.
2019 marks our 82nd year as a southwest Indiana farm! To maintain an adequate standard of living for each partner’s family, to be good stewards of our resources, and to prepare for future opportunities. Guiding that mission are the following principles that are important to our families. These ideas are the template for our decisions and shape our style of management. Develop a “long view” of goals. It goes without saying that the most important assets of the farm are the families involved. After that, the main asset of Carnahan & Sons is our land. Our longest-held farm was purchased by dad and mom (W. Lowell & Ruth Carnahan) in 1940, it was 100 acres for $70/acre. A significant farm location, the Burke farm, was purchased in November 2012, and let’s just say it was more than the 1940 purchase! (For more detailed information on this particular purchase at auction, see the post for November 7, 2012) Our latest addition was 37 acres purchased from a neighbor’s estate in summer of 2014. We began our operations there after the tenant harvested the corn in October of that year. Our farmland gives us the opportunity and flexibility to manage our business. We have 32 different locations, with one to six fields per location. The fields range from 1.2 (Watjen-across the ditch) to 309.99 (Freddie farm) acres in size. Each field has from one to nine soil types, and we use GPS technology to apply fertilizers and seeds with rates that are specific to each soil type. Currently, we own nearly all the acres that we operate, since in 2011 we moved about 5% of our owned acres to a partnership of the non-farming heirs. They now act as our only landlord, and we have a long-term agreement to manage those acres. This facilitates some of our estate planning, allows them to keep a connection to the farm, and gives the farm future access to the utility of that productive land. We are open to some growth by renting on a cash- or crop share-basis. Also we are seeking some land to purchase, even though that is getting more challenging. 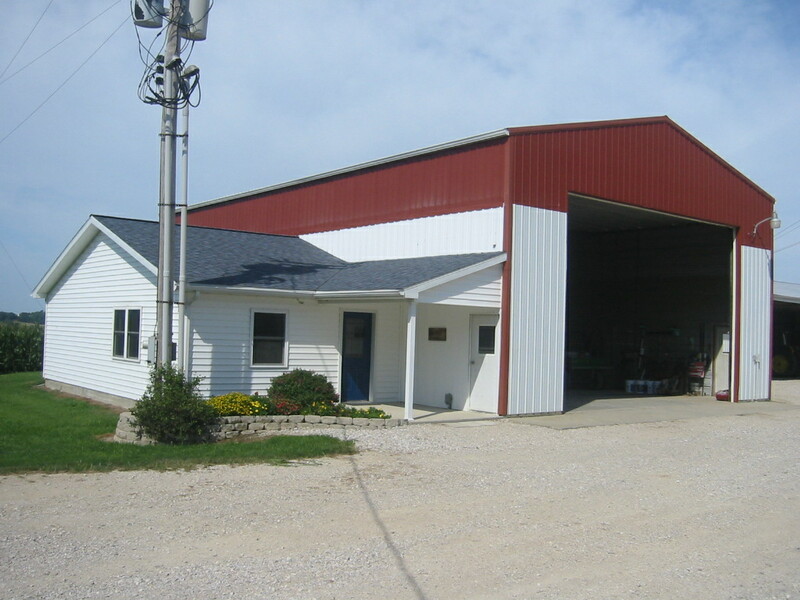 At our main farm location in Palmyra Township, Knox County, Indiana, are almost all the buildings for storing our equipment, as well as our grain drying and storing facilities. There remains one building, 60×60, made of concrete blocks that was original to the farm when we moved here in 1958. 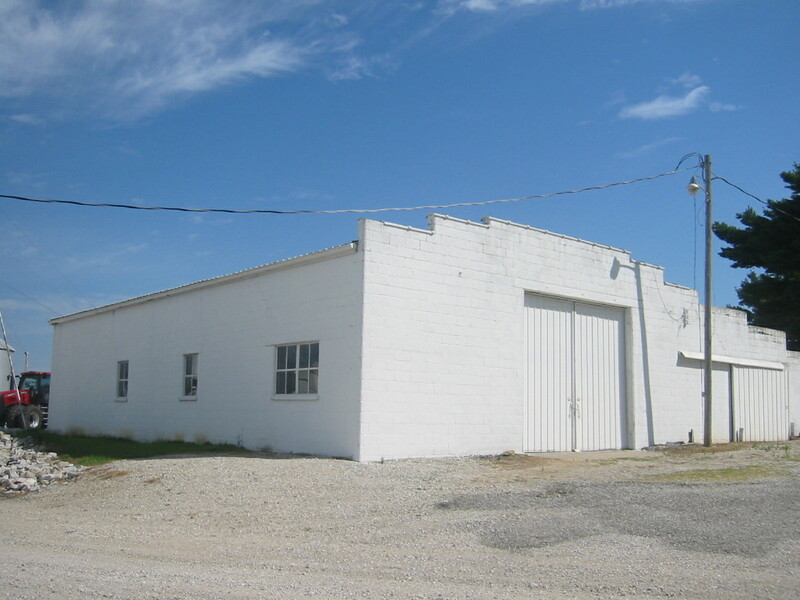 That building is utilized mostly for storing seed inventories ahead of planting season. Nearby is our shop with attached office. The shop is single-bay, 36×60, and it has evolved over time from a plain storage building, to our shop. It was remodeled again in the late 90s to add the 16×24 overhead door. In the same project, 5 feet was added to the walls to gain more clearance inside. The comfortable and convenient office was added in 2007. Next to the office is our fuel storage facility. Inside the environmentally-safe diked wall is storage for our highway and farm diesel and gasoline. The dual-compartment diesel tank has enough room for a tanker load of both highway and off-road diesel. It can also be locked for security. 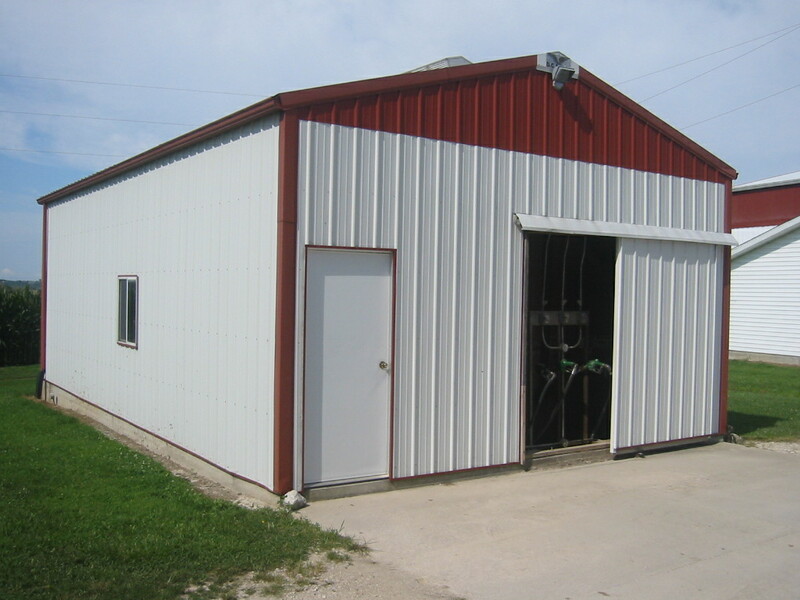 Our newest building is a 60×120 storage barn for the combines, headers and a few trucks. It was built in 2009 to replace a 1961 cattle and hay barn that we had re-worked over the years to store machinery. When it was damaged in a 2008 storm, we chose to replace it rather than repair. 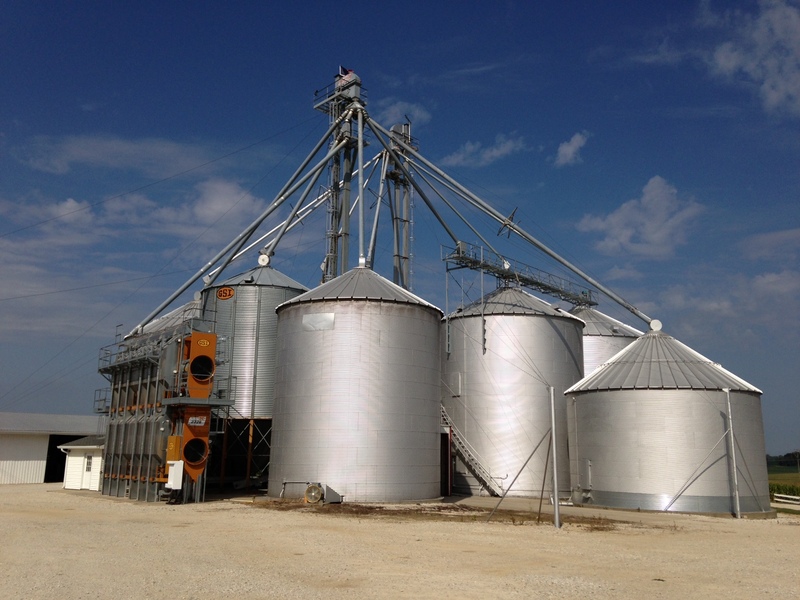 This is our grain conditioning and storage facility. The grain dryer on the left side of the picture was new in summer 2012.
combines, the dryer now has sufficient capacity to keep up with the field harvesting capacity… and what’s more, it does that with an increase in energy efficiency of 30%! There is more than 8000 bushels of overhead load-out capacity in two hopper-bottom bins. This gives us about 220,000 bushels of storage capacity in total. This is not quite large enough to contain an entire harvest, but by using forward contracting, it gives us quite a bit of marketing flexibility. How well are we equipped to go to the field? Our fleet of machinery includes 2 4wd tractors; John Deere 9360R and a JD 9520R. The other tractors are; Case-IH MX 290 and a John Deere 7130. We use two combines, a Case-IH 8250 and a John Deere S780. Each uses a 12-row corn head or a 40-foot draper header. Some think it’s strange that we run two different color combines, but it works for us. Ross gets to drive the red one he prefers, and Dennis drives the green one of his preference. Our planting equipment includes a Case-IH model 2150, 24-row corn planter, and a John Deere 1890 air drill, 50 feet wide with 10 inch rows, with an attached 1910 air cart, 350 bushel capacity (tow-between). We also run a John Deere 4730 sprayer, with a boom width of 100 feet, and radar-operated boom height controls, in addition to the swath control and autotrac features. The sprayer also is equipped with a special device that senses the wind speed and direction, the wet- and dry-bulb temperature, and humidity. As John is spraying, these weather conditions become part of the digital records along with the pertinent information about what was sprayed in each field. We try to keep these main machines as current as possible, to take advantage of newer technology, and to improve reliability. Combines are purchased new on a 4-year cycle, planters typically every 3 years. We replace our tractors at 3 to 6 years, depending on trade-in incentives, advances in technology, and/or the number of hours on the current tractor. There are two homes here at the farm: Ross and Rhoda live in a remodeled version of our parents’ 1950’s era home. Dennis and Pat raised their family in the home they built in 1980. John and Ashley have recently moved into their newly-constructed home, located on Junkin Road, in the SE corner of our Shake farm. They have been very happy in their starter-home in Vincennes, but look forward to having their family at home out in the country. We continue to look for modest or reasonable ways to expand our operation. If you have some land in Knox or Daviess Counties in Indiana, and you think that our family seems like we might be a good fit for you as your farmer, please contact us. Also, we continue to look for land purchasing opportunities, and if you are nearing retirement, or have any situation that may lead you to sell some land in our area, please let us have an opportunity to discuss that option with you. We remain optimistic about the future of agriculture in general, and about our farm business in particular. I came to know this family in 1992. There is no more genuine, caring and loving people than this family. My buddy Frankie and I, spent a luncheon with Lowell during some of his last days. Ross taught me a bunch about Quarter Horses also. Yes. I really have a real badge now. I still mess with Quarter Horses. I am looking forward to bringing my children and wife to the Carnahan Farm(s) and introducing them to you all.